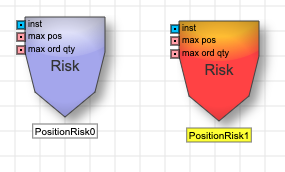 The Position Risk block lets you set per-instance pre-trade risk check for the maximum position when placing an order. Before the algo submits an order, it ensures that the submitted order quantity would not exceed the specified maximum position for the instrument, account, and order side combination. You can use the block to set lower position limits for an algo than are defined for an account in Setup. Note If the maximum position for the Risk Block exceeds either the total maximum position or maximum long or short position defined for the account in Setup, the order will be submitted by the aglo but then rejected if the order quantity would exceed the limit defined in Setup. 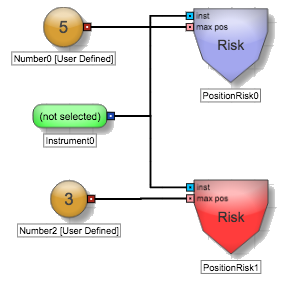 Example This algo uses two Position Risk blocks to set different maximum long and short positions for the attached instrument. 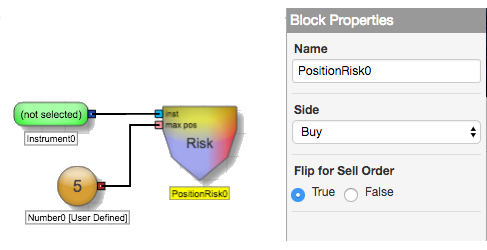 If you enable the Flip for Sell Order property, the limit will apply to the side chosen by the user when the algo is launched. Side Whether the block represents a limit for a long or short position. Whether to use the same limit for buy and sell orders. See Flip For Sell Orders Functionality for more information.